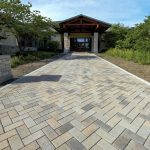 More and more homeowners are installing Permeable paver projects to help direct rainfall away from storm sewer systems and back into the natural ecosystem. The pavers used in a permeable installation look very similar to traditional pavers, but are made with extra space between them so rainwater can flow back into the earth below, instead of running off the surface into storm sewers. Special materials are used in the permeable base and joints to encourage water to flow through. Thornbury’s modestly textured surface and three compatible sizes allow for a pleasing random look and feel. This product is ideal for driveways, patios, walkways and more. Dura-Mat’s interlocking concrete units fasten together on all sides forming a permanent protective carpet. The interlocking system of Dura-Mat allows contouring to most terrain conditions. The solid-to-void ratio also allows for vegetation growth where desired.